I have seen Nirvana at Kalv�ya, Queen at R�sunda, and The Rolling Stones at SarsStock, Copacabana, Werchter, Isle of Wight, Slane Castle, Hockenheim and many other festival settings, with crowds anywhere from thousands to 1.5 million. 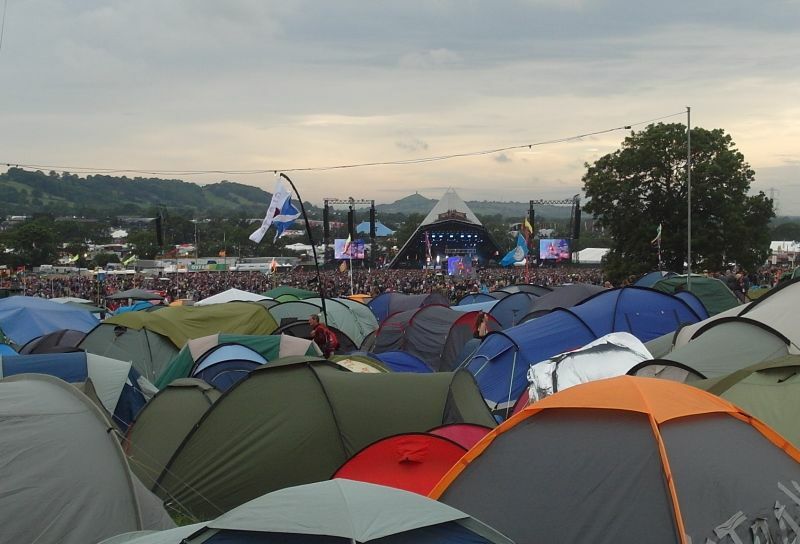 Nothing compares to the Glastonbery Experience. If you plan well - I had plenty of time - they you may turn a challenging live experience into something great. So I did! My journet to Glastonbury Started on Wednesday, flying into London for an early next morning 4am coach departure. 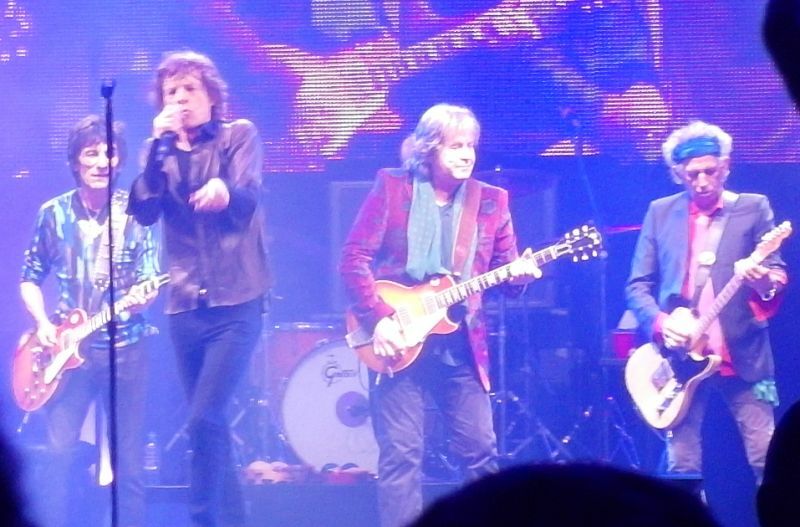 I had reserved five days for the two plus hours of Stones experience this Saturday evening. Sitting at Heathrow Airport in the afternoon of Sunday writing this review, I must say it was a great, great experience. Not the ideal way to see the Stones for a "superfan", but sharing my great pasion of life with more than hundred thousand British fans who most of them have never seen the Stones live ever. I spend Wednesday on travel, Thursday sorting out the area, Friday watching Bill Wyman's Rhythm Kings on the acoustic stage, and Saturday preparing for the main event - The Rolling Stones on the Pyramid Stage. By 6pm I was all set in the front of the stage, around row 10 or so. I was ready for staying in the same spot without moving for six hours. People around me were all Primal Scream fans, as they knew every song, singing along, making great fun of the act that was before the Stones. I think it is safe to say that I saw everything there is to see at a festival within my next 10-15 feet or so in the crowd. My fellow fans around me sniffed and drank and smoked everything there is of substances. The ground took over the care of any left-overs. Average age 30 or so +/- so I was not really the youngest in the crowd, but I had a clear mind. Jumping Jack Flash was the perfect start for this crowd. 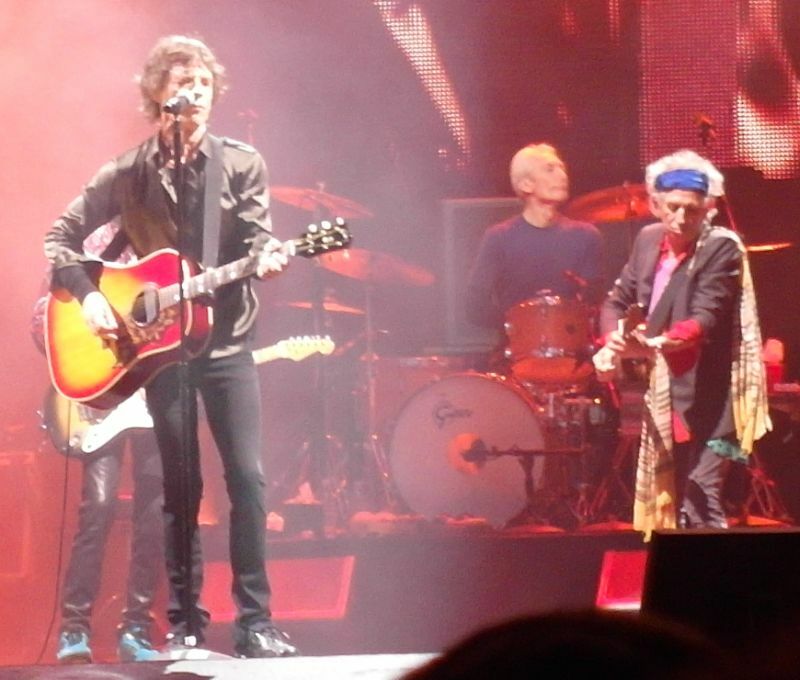 The Stones use it for club show startup and it is giving any crowd a kick-start. Immediately. 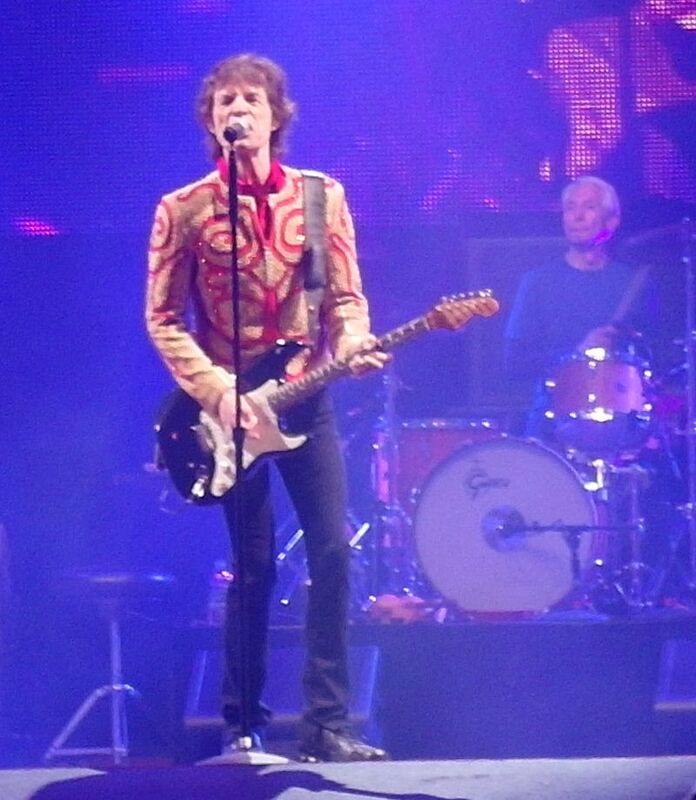 You loose the long jamming version of JJF we get at the end of "regular" shows, but it is like a heart starter - Mick want to make sure that the crowd is there, up on their feet, clear minds for a start, and it works! I have never ever heard so many singing along to JJF. And these guys are all Primal Scream sort of young fans. They have never seen the Stones live, but they do know their music. It's Only Rock'n Roll keep the same excietment in the crowd. Everybody singing. All the words. Like they use to go and see the Stones every time they come by... Paint It Black ... By now I was fearing this would turn into a River Plate sort of scene, where everybody is jumping up and down and moving my body around without having my feet on the ground. Well the crowd is great but not at the Buenos Aires lever still. With hours of hours of walking, drinking, sunshine, waiting and limited sleep, you just can't expect the crowd to keep the opening pace for two plus hours. But they are on. Paint It Black works great! 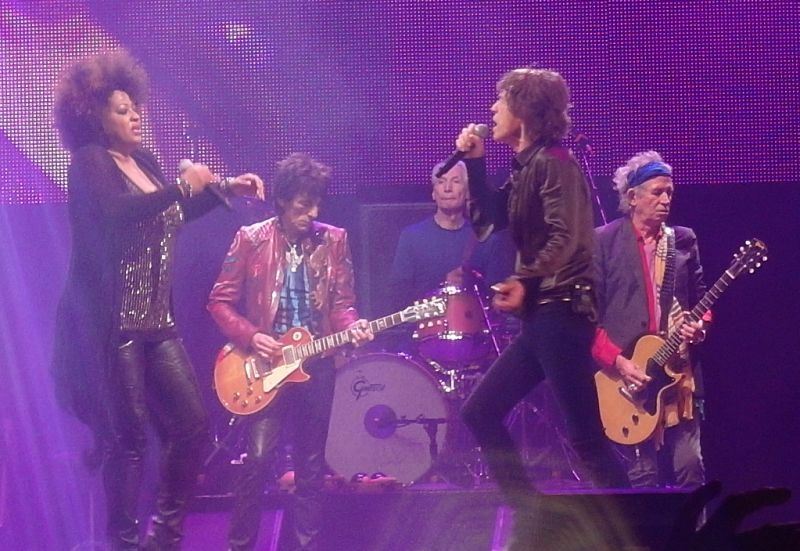 Gimme Shelter is next. They have simply switched into the 2013 tour setlist, I think for a minute. Just replacing the first song with a solid winner, then swithing into the safe 2013 tour set. How wrong I can be, as I will see later on in the show. 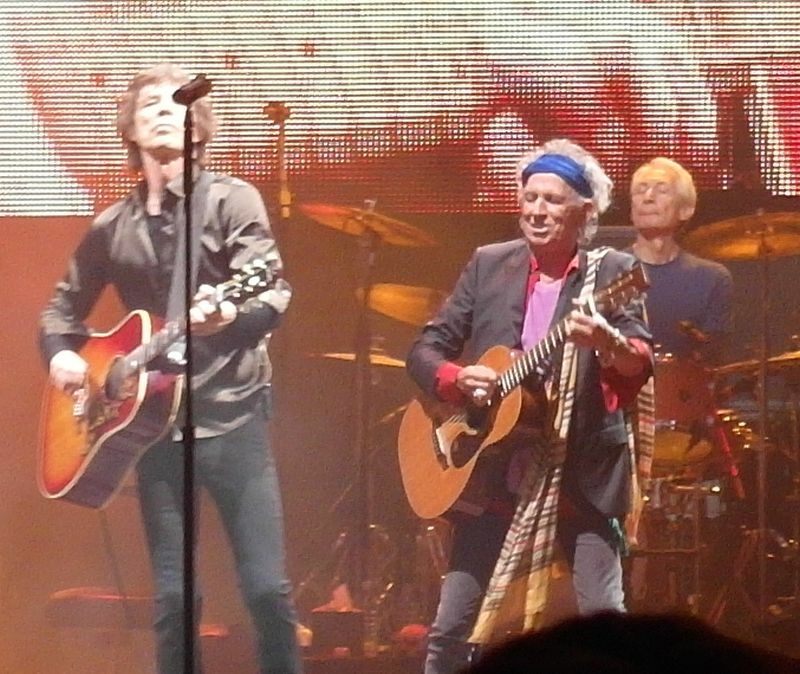 During Gimme Shelter I realize how close all the band members are on stage, for most of the show. It is like they feel to be close with this massive demanding crowd. 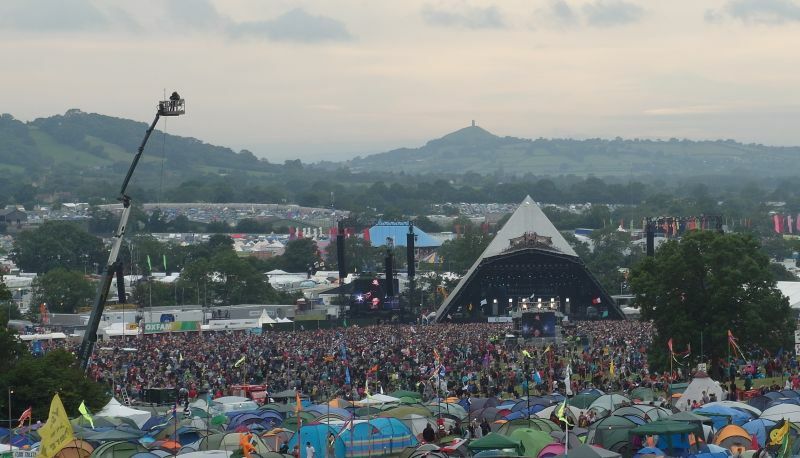 Even if they have built a small running ramp that is bringing them closer to us in the front, they do not really have any physical close contact with the more than 100,000 Glasto campers who fill up the field, the hillside, the tent areas and all over. So they keep close. At one point, which I unfortunately did not catch on camera, Keith is leaning on Keith, in front of Charlie of course, and I can see that they are making themselves safe in this massive crowd. And it is during Gimme Shelter I just shoot this great picture which is on the IORR home page, all of the band in front of Charlie, sort of trademark of the Glastonbury show. 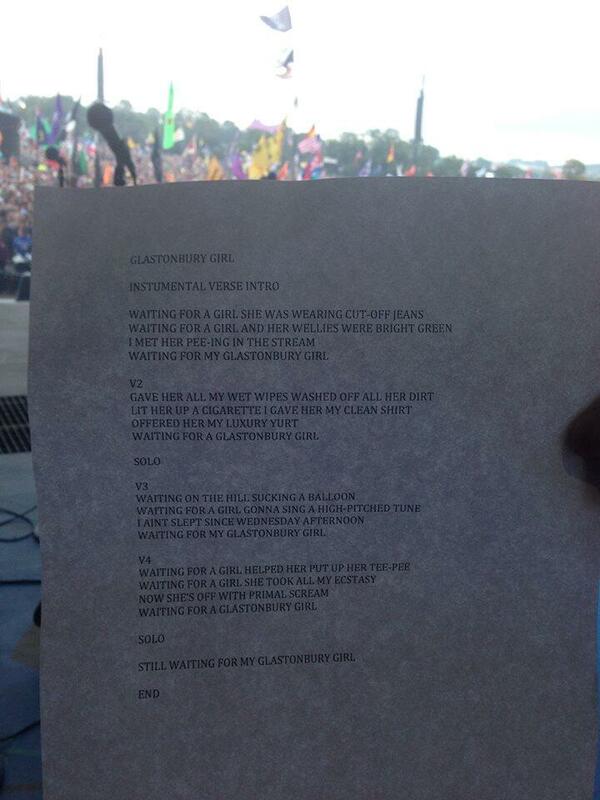 Then they do "Glastonbury Girl", a version of "Factory Girl" with new lyrics. Mick is getting time to relax, and the already pretty exhausted crowd is getting some rest as well. Then "Wild Horses", another slow song the please those who spent too much energy early on in the show. "Can't You Hear Me Knocking" is brave, real brave to do on the Glasto stage. But it works. 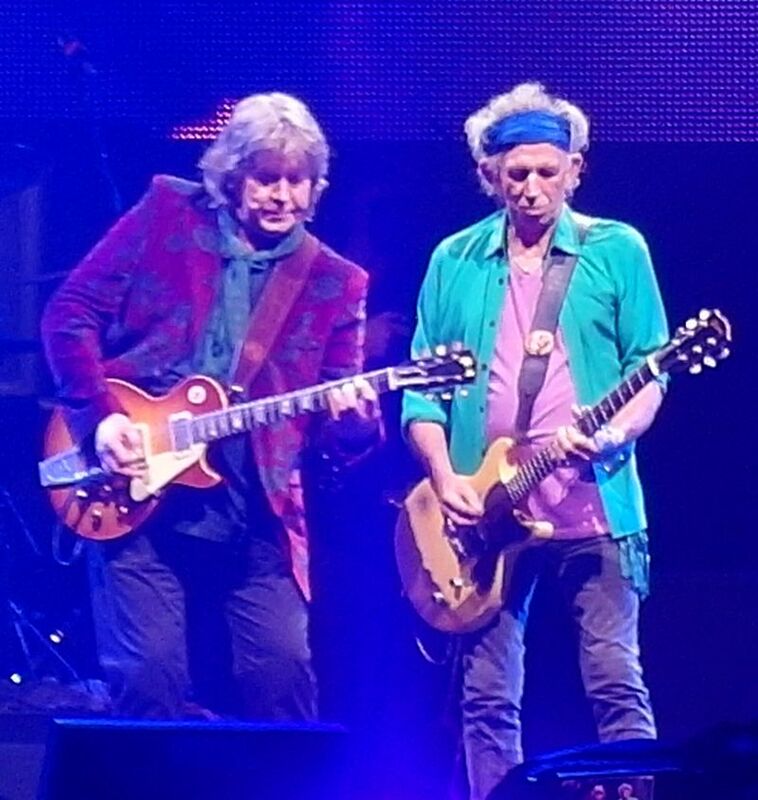 We do not get to hear the finer details of the guitars which works so well in the arena setting, but for a crowd of 100,000+ it is great, and Mick taylor is the local hero for the day. For the song. Honly Tonk Women is bringing the crowed back on pace. By now we have girls and guys flshing everything they have, I will not show you those images, but it is festival mood. People are happy. And they want to show it some way. We all have different way of showing we are happy. HTW works great! Ronnie Ronnie Ronnie! 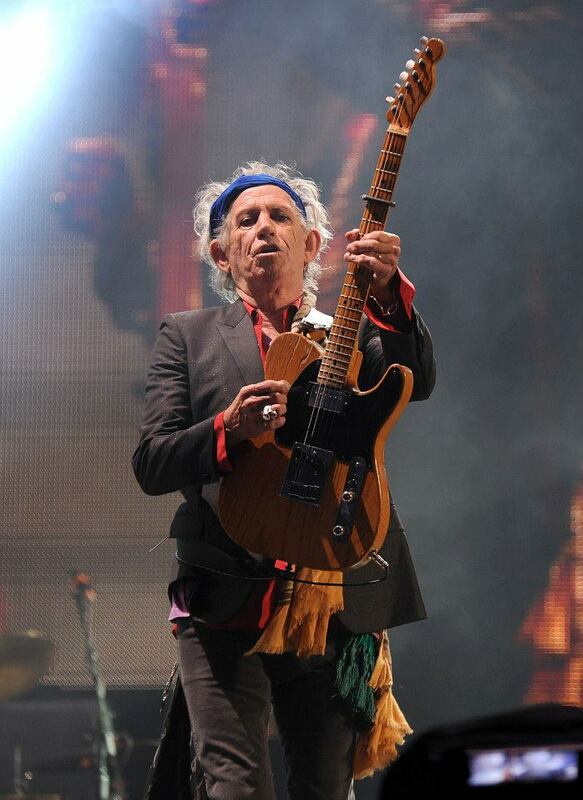 During the presentations we all know who is the Glasto hero, for now, but that is until Mick introduce ... Keith ... A big "Keith roar is all over, and there he is... Telling us all why we feel so burned - it is the sun - we are not used to it. It always rain in Glastonbury they say, but all day today - sun shine! "Silver" and "Happy" works great. Again I see the band is literally on a small stage with a big crowd. 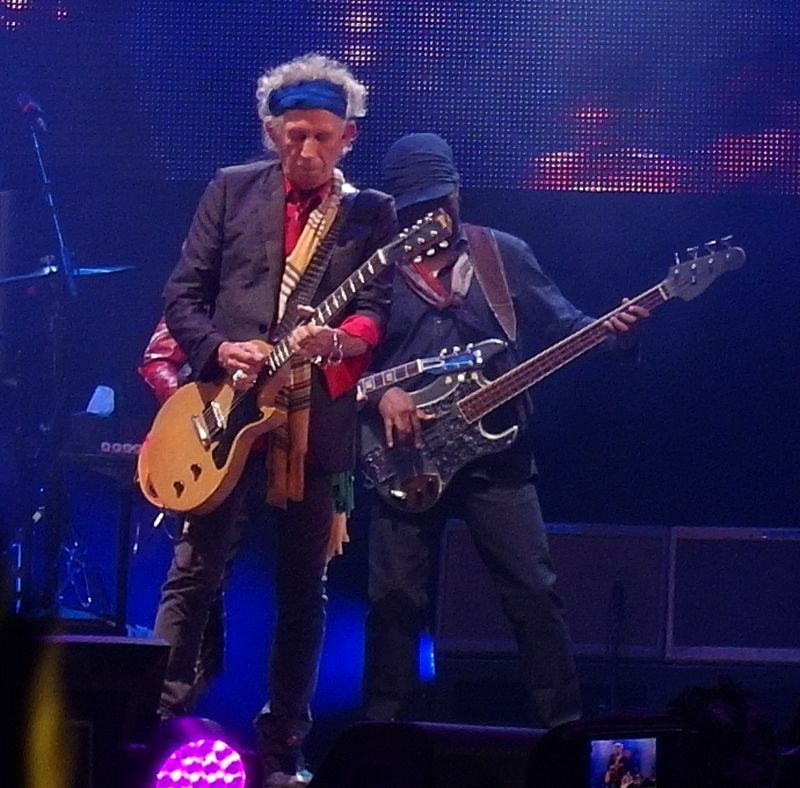 Ronnie and Keith up front. I don't know what the screen is showing but it is simply all happening on a small spot. Then time to kick-start the crowd once more with Miss You, everybody singing along. Midnight Rambler is as we know it - a rock/blues symphony where the band is working the crowd through their visuals and their musicalk performance. Mick Taylor playing what he is best at, the lead, and Mick having the crown in his hand, just love this song! Then a strange song selection for a different crowd - 2000 Light Years From Home. At first it sounds strange, but with the visuals and the sound, I see why they chose to do it. The sound is may nbe not the best where I am, but their performance is great, and the shifts in the song from slow to fast and all the mystery is there, very nice for Glasto! The rest of the show is the "home run" part, they know they have won the game, this is now about making the crowd remember this show as lomg as they live. At one point Mick says we should come back to another show. I will! For the encores I have worked my way through the massive crowd, to see the last part from the "big crowd". It is packed, very very backed. I work my way and finnaly I get some 'breathing space all the eway up to the bar tent areas. There are people just everywhere. And they see almost nothing! The screen is useless. I can't see if there is a choir on stage, sure I can hear them, and I do see bits of singing people on the screen, but at this remote position all I get is the sound. Still everyone is singing along, dancing, nobody walking around, like people do at stadium shows, they simply stay with the show. After two hours fifteen minutes it is all over. People walk slowly to their tents and meet up with each others. I get to sleep at 2am, the show is in my ears and the impressions are so many. I have npot read anything on the internet for 24 hours. 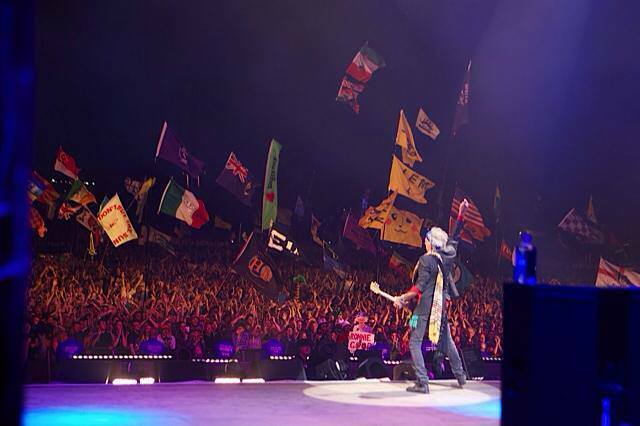 I see there are 800 posts and more than 70,000 views on the IORR live thread about the Glasto show. May be later I will find out how this show was as seen rom the outsoide world, on the screen. For now I am taking care of my memories from being there by writing up this. I could have written for hours but my flight back home is soon. The Glastoinbury show was all worth the five days I spent going here. I was worred like parents are when their kids do their first appearance at school. The Rolling Stones are "mine" and I do want everyne to see thjem from their best side. Thank you Mick, Keith, Charlie, Ronnie, Chick and the rest of the band and crew. You did a great job, they say The Rolling Stones are greater than the Glastonbury Festival, well they said that before the show, but after the show I am sure everyone agree - yes - they are the greatest! See you in Hyde Park! If I may adapt a classic blues riff: I woke up this morning and thought I must be still dreaming. Slightly hung-over in a tent in a Somerset field after one of the best nights of my life, I contemplated the alternative universe of my Twitter feed. 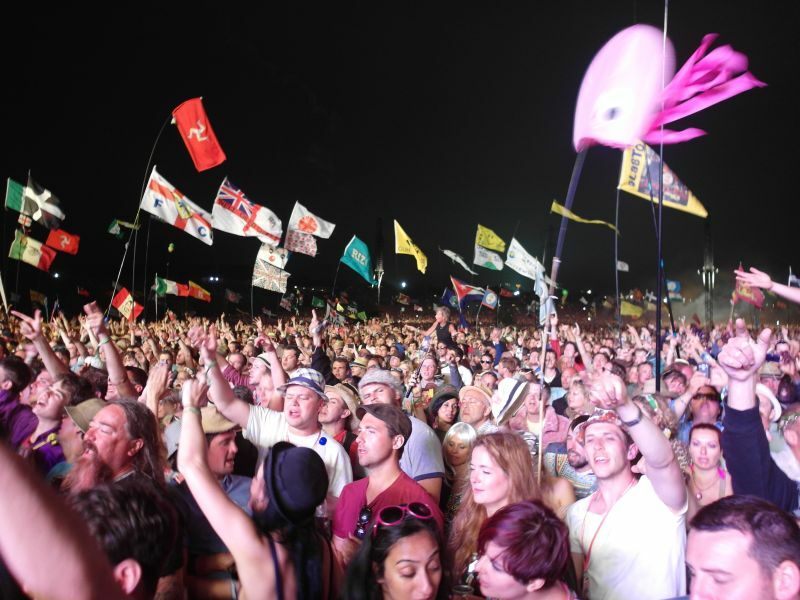 And there I was slightly stunned to find people who had stayed home to tune into BBC�s Glastonbury coverage from the comfort of their sofas were casting aspersions on a storming headline set by The Rolling Stones. It would appear that the veteran rockers� torturous negotiations with the BBC over limited broadcast rights had come back to bite Mick Jagger�s wiggly posterior. A set that started the home viewing 10 songs in and switched off before the encores had been judged safe, predictable and, even, that most 21st century of live problems, �badly edited�. Well, please allow me to put all the couch campers straight. The whole point of live music is that you have to be there. No one at Glastonbury was complaining about the Stones poor televisual skills. We were too busy playing our part in the greatest show on earth. Because on Saturday night at Glastonbury, The Rolling Stones restaged their claim to be acknowledged as the greatest rock and roll band in the world. I don�t think you would have heard any dispute from the record breaking 100,000 crowd of grinning, dancing, fist-shaking, flag-waving, flare-burning revellers sprawling up the hillside in front of the Pyramid stage. 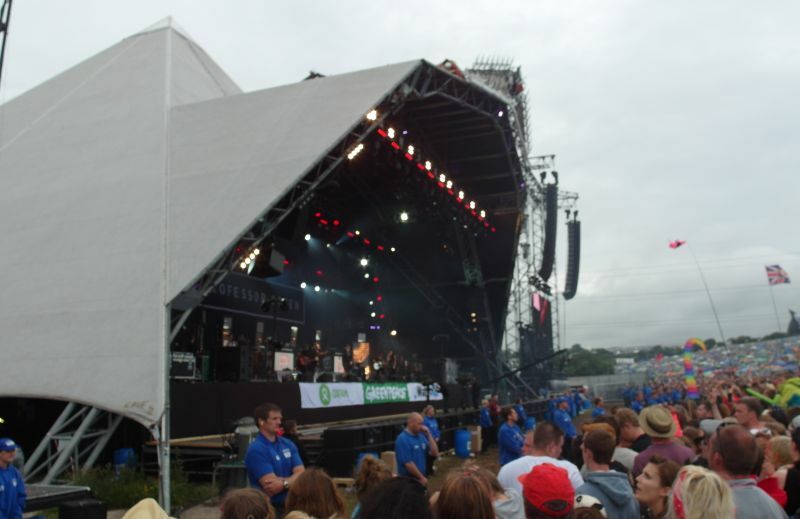 A live event is as much about audience as performer and Glastonbury�s happy campers greeted the old rockers with the kind of uninhibited relish that effectively gives permission for everyone to take this as far and as high as they can. The Stones responded with a smartly planned set of big hitters that constantly opened up into long, jamming, weaving guitar grooves spiralling into the ether, from a heart-lifting opening blast of Jumpin� Jack Flash to a fiercely motoring encore of Satisfaction, with Mick Jagger yelping �Gotta do it like Otis Redding� whilst goading Keith Richards into further sloppy riffing action. At times these 50 year veterans of the stage looked as dazed and happy as the audience. 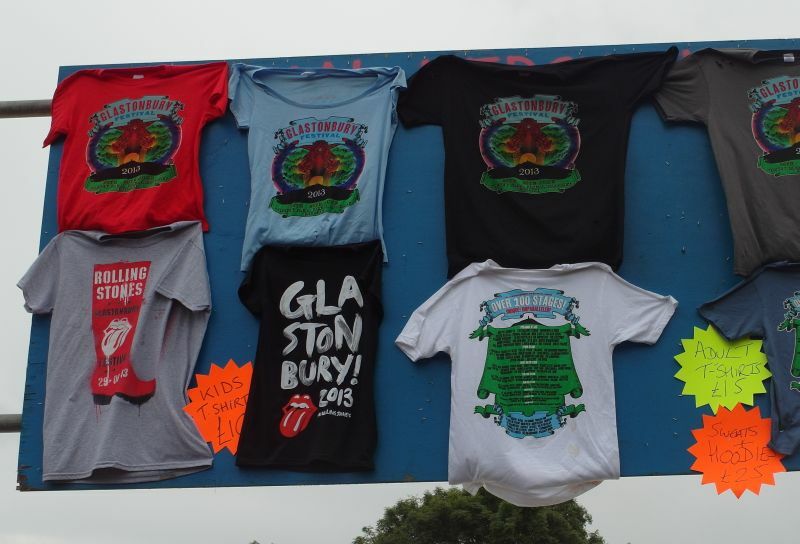 Pretenders to The Stones crown had staked their claims earlier on a sunny festival day. Hot Irish quartet The Strypes ripped up the John Peel stage with a blistering set of raw, garage blues rock, closely modelled on the Stones circa �64, with a dash of Eric Burdon�s Animals aggression, Yardbirds-style soloing and Dr Feelgood intensity. All this, and they are younger than One Direction, schoolboys ready to take over the world. Then Primal Scream warmed up the Pyramid Stage with limber rhythms substantially inspired by the Stones but perfectly recalibrated for a new (and frankly even more stoned) generation. 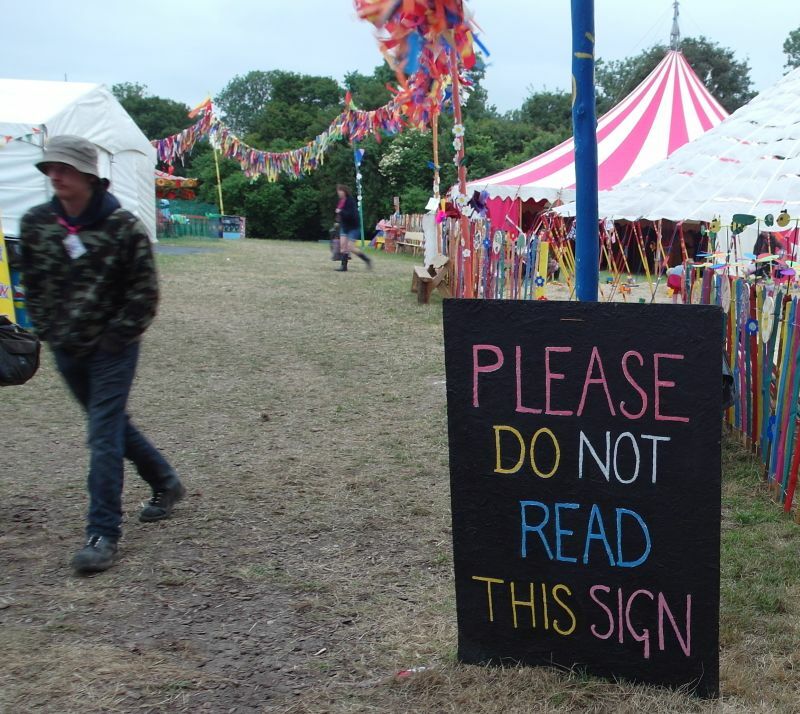 I thought they might be a hard act to follow. The Rolling Stones had other ideas, tackling this show with energy, charisma and a fearlessness that comes from a lifetime on the road. 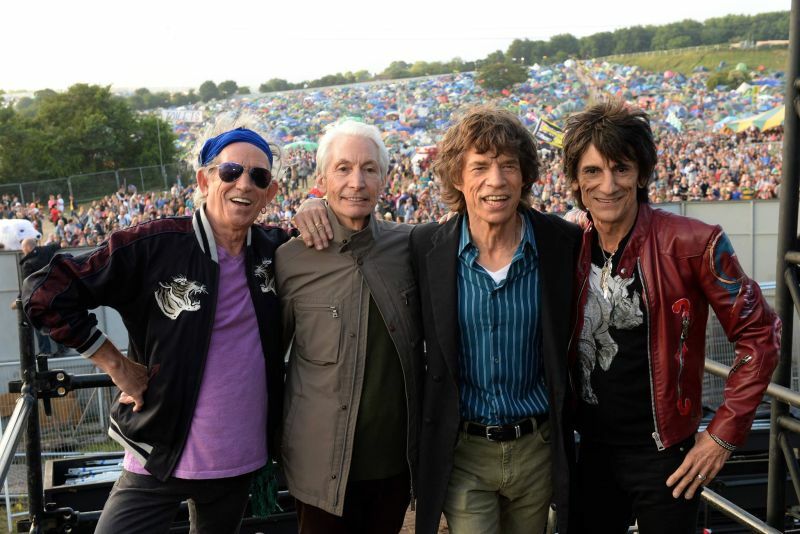 The Rolling Stones proved to Glastonbury's biggest ever audience, they were worth the wait, says Neil McCormick.